You don’t need to travel far to enjoy the summer, especially when everything is within reach. Here are a few suggestions to help you get your yard ready for summer so you can let the good times roll into the fall. Get your hands dirty and get creative. Gardening is a relaxing activity that helps make the yard more beautiful and inviting. Opt for perennials that grow well in your area. They require less care and are a good long-term investment. Get your kids involved by teaching them how to plant flowers, distinguish between the different varieties, and identify weeds. All sorts of things pile up in the yard over the years. Nothing screams clutter like a rusty bike or a 12-piece patio set. Make sure the space is comfortable for you: repaint a few items in bright colors and get rid of any useless items. Prevent accidents by keeping your storage area clean and tidy. Use common sense: you won’t be taking out the winter tires or snow blower any time soon. We often lose or forget hard-to-access items, so leave the lawn chairs and fishing gear in plain sight. 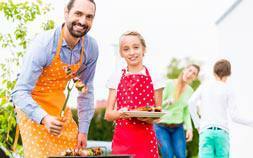 Carefully inspect the grill and clean it thoroughly. Burn off the grease by turning the burners to high, then scrub everything thoroughly with dish soap or baking soda. You can also soak the grates in plastic bags with a little ammonia. A grill in good working order will last longer. If necessary, change the automatic igniter or buy a good lighter. Now that that’s done, break out a recipe book or two and BBQ like a pro! 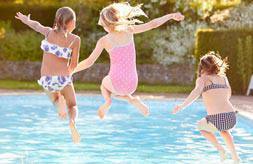 Don’t put off pool maintenance tasks for too long. Establish a maintenance program right away. Also think about installing a switch to easily turn the filtration pump on and off—not only will you save money, you’ll eliminate noise pollution, too. Set up a few chairs and a table in a quiet corner where you can enjoy a cup of coffee in the morning or a glass of wine at the end of the day. This will help you make the most of your outdoor living space. Get together to fire up the BBQ or swim under the stars. The best parties are often last-minute, so invite your friends over at a moment’s notice. Is it nice out? 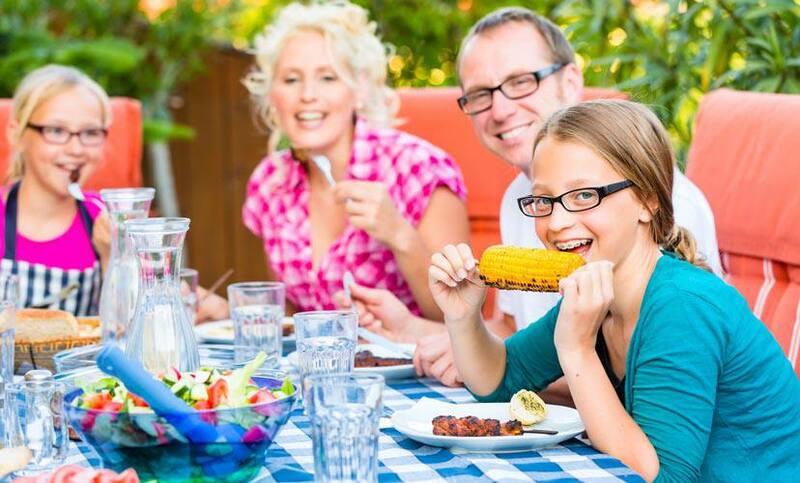 Invite your family, colleagues, and neighbors to taste your new culinary creations. Take the kiddie games and chairs out of the shed, and let the fun begin! Your home will be a hub of activity, so make sure your family has affordable coverage against the unexpected. At Blue Cross, we’ve been looking out for your well-being for more than 70 years. Our supplementary health benefits are a great complement to your provincial health plan. Be prepared for the unexpected, and have a great summer!